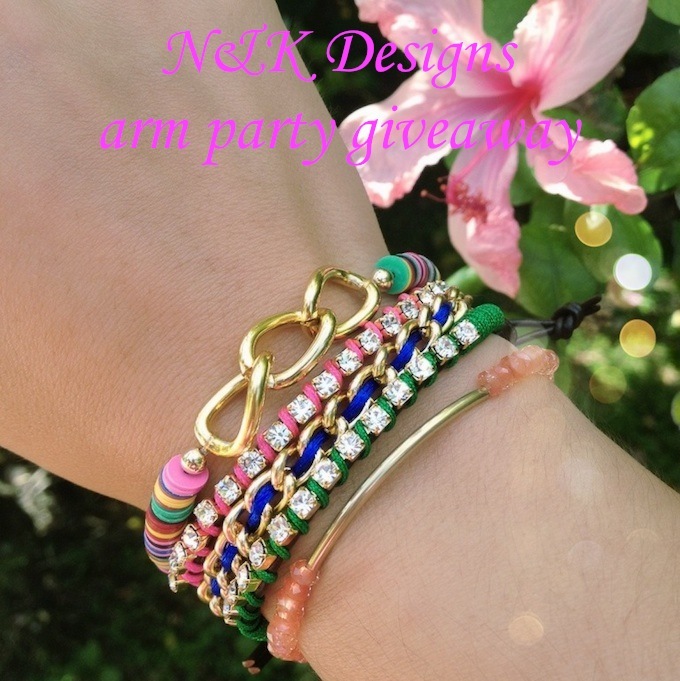 N&K Designs arm party giveaway | Cosa Mi Metto??? So it's giveaway time again girls!!! Do you like this wonderful arm party worth $200 from N&K designs? It could be yours!!! - Follow Cosa mi metto??? p.s. the lucky winner of the Vivilli.com sunglasses/fashion jewelry giveaway is: Samantha T., you'll be contacted very soon! E' arrivato il momento di un altro giveaway!!! Vi piace questo bellissimo arm party del valore di $200 di N&K designs? Potrebbe essere vostro!!! -Entrata extra: seguire @cosa_mi_metto su instagram! p.s. la fortunata vincitrice del giveaway Vivilli.com sunglasses/fashion jewelry è: Samantha T., sarai contattata a breve! ma sono bellissimi questi bracciali!! I´m following you on twitter, facebook and bloglovin too. Follow back? Ma guarda che carini questi braccialetti!! Quelli rosa e verdi sono stupendi Fabri!! sono proprio carini questi bracciali!!! e certo che partecipo !!! bellissimi i bracciali *-* !!!!! Ti seguo anche su instagram! Oh, those are soooo pretty! awesome giveaway! Love the bracelets! Sono a dir poco stupendi i bracciali!!! I am now following you too. Of course I would like to follow each other but I follow you since the other day. Meet me at mine. Kisses. Thank you so much for your sweet comment on our blog! ti sego anceh su instagram come eleonora_marchetti! Great giveway, hope its open international..
Love it and entered! I'm following you and N&K Designs on Facebook, GFC, and instagram! Thanks for telling me about the awesome giveaway! I did everything! Thank you!! very nice giveaway..thank you for your comment dear..did all the things needed for the entry.. Hi!!! I love this blog and I'm following you back! I'm so glad we found eachother! Your blog is adorable and this giveaway is to die for! Love that Arm Candy! I entered the giveaway, I followed your page, I liked the two facebook pages and I also follow you on instagram. I'm following you. Let's follow each other? que pulseras tan bonitas! me encanta tu blog!